Great concern has been expressed for the future of the hazel dormouse as its numbers across the country have declined by at least a half in the past 100 years. 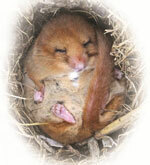 Dormice are a 'flagship species'. Where they occur the habitat is usually very suitable for a wide range of other species. They are also important as 'bioindicators' as they are particularly sensitive to habitat and population fragmentation, so their presence is an indication of habitat integrity and sustainable populations of other sensitive species. In 2008 a grant from the BBC Wildlife Fund enabled us to set up new nest box monitoring sites in areas of the county where we have few records of dormice. A further grant in 2010-11 has allowed us to further extend our dormouse research to look at nest box preferences by dormice and their use of unusual habitats such as roadside nature reserves and churchyards. 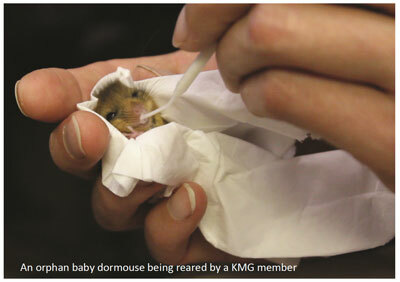 The grant also funded a South East Dormouse Conference held in March 2011 and hosted by the University of Greenwich. 178 dormouse monitors and volunteers from throughout the South East met to exchange ideas and hear about the latest research from dormouse experts. We are a charitable organisation dedicated to the conservation of Kent's wild mammals. Come to our regular monthly meetings with fascinating talks by a variety of mammal experts. Receive our newsletter, Quadrupedia, and frequent e-bulletins from our chairman. You don't have to be an expert, but you might one day become one! We sometimes need more trained and licensed volunteers to monitor the nest boxes. Our training scheme can take a few years but it is ultimately very rewarding. Records of any mammals contribute to the greater knowledge about the county's wildlife. Fox, rabbit, hedgehog – no record is insignificant. 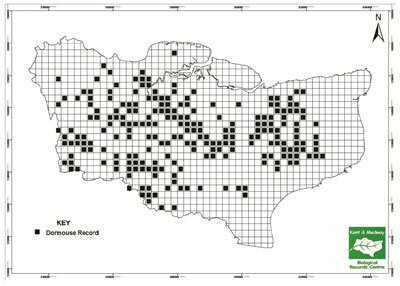 You can download mammal recording forms in our downloads section, and soon we will have an online recording facility. Have you ever seen a Dormouse? The chances are that you haven't, even in captivity, unless you have been trained to monitor them. Zoos that have them don't usually display them, as they only come out at night. Dormice are small, uncommon, nocturnal tree-dwellers. They do, however, hibernate on the ground, and this is probably when they are most often discovered by people, as they may choose a coun-try garden in which to do so. Sometimes they roll out of a hedge bottom by accident whilst asleep. Cats catch them only occasionally. Kent is one of the best counties for dormice, even so their habitat is under threat. Dormice prefer ancient woodland and good quality hedgerows, with a variety of trees and shrubs, though they may turn up in less suitable habitat, so long as there are trees, bushes or brambles. What do Dormice look like? 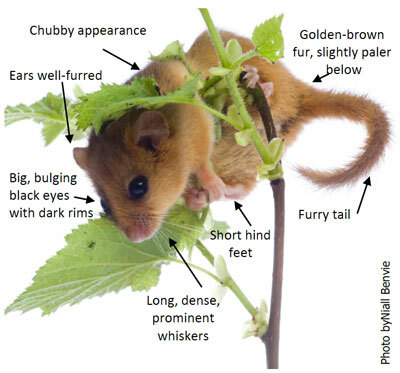 The picture shows the key recognition features of a Dormouse. The 'mouse' part is misleading, for although they are small rodents they are not very closely related to our other native mice and their lifestyle is quite different. Dormice differ from other British rodents in a number of ways. Most importantly, they hibernate for up to seven months of the year. This is where their country names of seven sleeper and dozy-mouse come from. Similarly 'Dormouse' derives from the French word dormir, meaning 'to sleep'. Normally only insect-eating mammals, like bats and hedgehogs, hibernate. Although the Dormouse does eat insects at certain times of year, it is a specialist on short-lived seasonal foods such as various tree flowers and pollen, as well as fruits nuts and berries. in times of bad weather or food shortages during the summer, it lives longer than typical mice, sometimes as much as 6 years. We all know how many familiar kinds of mice (and other small rodents) can have several litters of babies in a year and sometimes reach plague proportions. The Dormouse usually only raises one litter of around 4-5 babies each year and mum invests a lot of time and energy in parental care. In fact, she looks after her young for up to 3 months. Contrast that with the 18 days that a Wood Mouse affords her offspring! Why are Dormice rare and does it matter? In the UK populations are declining and becoming fragmented as a result of habitat loss and because of the influence of climate change giving us cause for concern. In Britain the Dormouse is a fully protected species under the Wildlife and Countryside Act and a special licence from Natural England is required even to handle them. Many agencies are working to reverse their decline. Dormice are a unique member of our fauna. Like all creatures they have an important place in the ecosystem.